YSL Rouge Volupte are cult beauty lipsticks with a luxurious golden packaging and an ultra creamy lipstick that provides effortless color pay-off and comfort. Let just say YSL lipsticks are statement pieces in beauty world as Louboutin in shoe department. But whether these lipsticks are worth the hefty price tag, we'll consider further in this post. I was lucky enough to receive my first YSL Rouge Volupte from my sister as a birthday present. 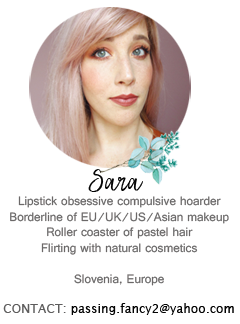 You can imagine my reaction as a lipstick hoarder I am. 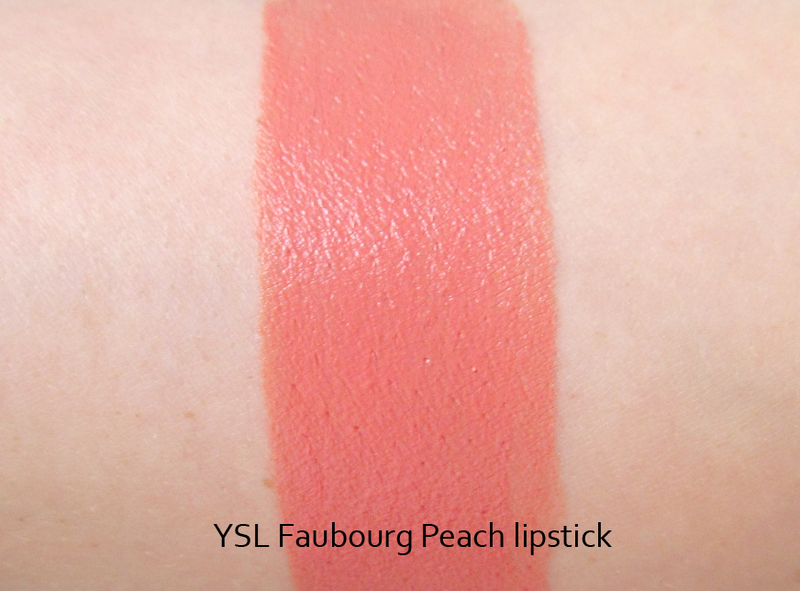 YSL Rouge Volupte in 30# Faubourg Peach is actually a perfect mix of light apricot and a small hint of pink just to make it enough wearable even for palest skin tones. It also has a hint of white mixed in which gives this lipstick a 60's feel. Just a perfect pastel apricot. I can imagine it being gorgeous on tanned skin, especially in summer. 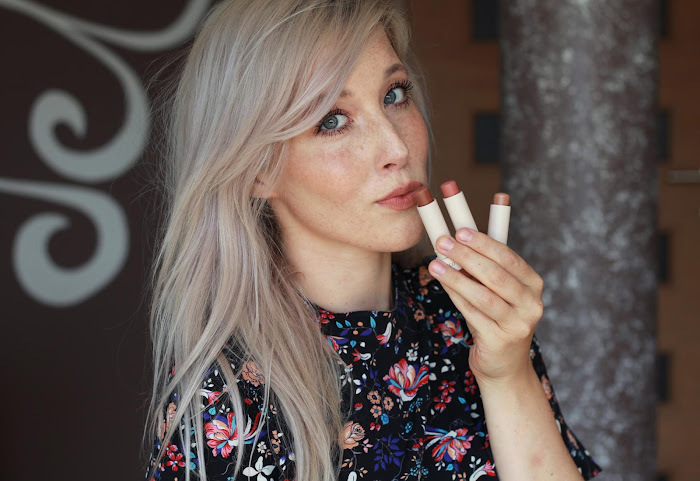 I would add Faubourg Peach a pinch of pink to make it a perfect apricot for my personal taste and neutral skintone. Fear not, you have plenty more shades to choose from Rouge Volupte - this range has a massive color scheme. Lipstick comes in a gorgeous golden tube with some color to match the inside. YSL logo is just stunningly beautiful. Also, lipstick case has a certain weight to it, so you really feel like a million dollar baby when you reach into your bag. I was only a bit disappointed with twist up mechanism since it broke after only several uses. I can still twist the lipstick up but can't twist it back down without pushing the lipstick down. I'm also pretty neutral about the bullet, edges are harsh so it's commonly known your lipstick will always loose a piece on the higher point. I can't think of any creamier lipstick in my stash. It's actually too creamy for my liking. Texture reminds on NYX Round lipsticks which are slippery. Lipstick definitely feels great on the lips but I can't imagine wearing a darker color in this formula. Don't get me wrong, you can easily wear Rouge Volupte in light shades but wines, plums and reds could be potentially hard to keep in their place. I highly suggest a lip liner with these lipsticks. Finish is definitely creamy, not matte or glossy. Lighter colors can enhance dryness so a lip balm is a necessity before applying Rouge Voluptes. Pigmentation is out of this world. You get a full opaque color in just one swipe, which can be a good or a bad thing depending on a person's liking. I enjoy opaque lipsticks so I'm pretty much happy with color pay-off. If I'm not mistaken, all Rouge Volupte have a high pigmentation with a creamy formula. I can't say I've experienced outstanding long lasting finish so they're pretty standard in this department. I could say color obtains for about 2-4 hours tops which is quite frankly expected from a creamy formula. Nothing extraordinary here, unfortunately. Rouge Voluptes have a sickly sweet melon scent which disappears after application. Honestly, I'm not too fond of any melon/watermelon scent because they're too fake for my taste. Searching for dupes was easier than I thought. A perfect dupe would be Barry M 147 lipstick but I got rid off it because of awful texture. Keep in mind Barry M 147 lipstick has a matte finish and is extremely uncomfortable on the lips. In my current lipstick collection, the most similar one is definitely Topshop Ohh La La. It's a tad bit darker with less pastel notes. Etude House Dear My Blooming Lips in OR204 is pretty similar in person but a bit more pink. P2 Copacabana is darker and more vibrant, Maybelline Whisper in Coral Ambition is sheerer and more pink/neon. 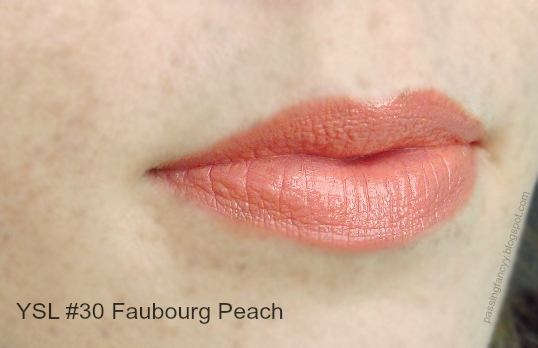 Bourjois Color Boost Peach on the Beach has definitely a more vibrant color with pink undertones. NYX Black Label in India is way more light and pink than YSL Faubourg Peach. All these colors are definitely more pink or less pastel in person. The closest would be Topshop Ohh La La but it lacks pastel and white notes. Zdaj sem pa totalno srečna, ker imam tole Essence doma. :D Super post! I absolutely love the color, its so pretty! @katherine: yup, it goes instantly in the gaps on the lips. Kolk je lepa ta barva?! Zdaj imam pa še eno šminko na WL. i have the barry m one but find it so dry and hard to apply...any tips?